Eczema Soothing Soap, 4 oz / 112 g (All Terrain Co.) - Penn Herb Co. Ltd.
All Terrain Natural Eczema Soothing Soap is specially formulated to naturally and safely cleanse and soothe itchy, irritated skin. Great for general skin discomforts and rashes. It uses natural ingredients that provide safe and effective relief by soothing dry and sensitive skin area that needs special care. 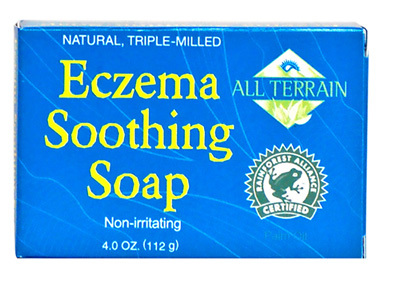 Natural Eczema Soothing Soap is independently tested, non-irritating and uses Rainforest Alliance certified Palm Oil. INGREDIENTS: Sodium Palmitate*, Sodium Palm Kernelate, Water, Glycerin, Melia Azadirachta (Neem Seed Oil), Melaleuca Alternifolia (Tea Tree) Leaf Oil, Sodium Chloride, Sodium Gluconate, Glycine Soja, (Soybean Oil), Helianthus Annuus (sunflower) Seed Oil, Plantago Major (Plantain) Leaf Extract, Malia Azadirachta (Neem) Seed Extract, Avena Sativa (Oat) Kernel Extract, Iron Oxides (C177492, CI 77499 and CI 77491). *Rainforest Alliance Certified™ Palm Oil. Cleanse and soothe itchy, irritated skin. Great for general skin discomforts and rashes; soothes dry and sensitive skin. Lather, let sit for 1-2 minutes, then rinse. Pat dry.